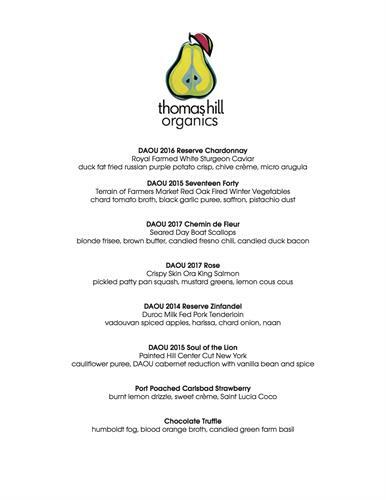 Join Georges and Daniel Daou at Thomas Hill Organics as they celebrate the continuation of the DAOU legacy. During this exclusive, intimate dinner, you will experience first-hand what it means to be a family-owned and operated winery as Lizzy Daou and her father, winemaker Daniel Daou's daughter, share insight into her journey to winemaking, her first harvest of 2017 and her close mentorship by her Father. We will serve an 8 course dinner expertly paired with six highly-acclaimed DAOU wines; 2016 Reserve Chardonnay, 2015 Seventeen Forty, 2017 Chemin de Fleurs, 2017 Rose, 2014 Reserve Zinfandel and the finale flagship: 2015 Soul of a Lion. Live music by Matthew Kim and Donna Lu.